This is deeply somber news. Unfortunately, things have not gotten any better since the January 25th protests. Please take a moment to read this letter to be sent to congress and consider signing your name to the petition. 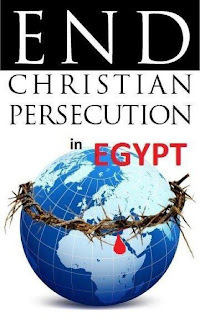 Another petition requesting that the $1.3B in US annual aid to Egypt be cut off until something is done about these acts can also be found here. The Holy Synod of the Coptic Orthodox Church under the leadership of Pope Shenouda III met with seventy Bishops, on Monday October 10, 2011 in the Papal residence, Cairo, Egypt to discuss the events of the prior day in front of Maspiro where 24 of our beloved children were killed and at least 200 injured. Coptic Christians feel that their problems are always being repeated without accountability and without the due justice of the law.Eyewitnesses & countless photographs and videos recount how the Egyptian Military used armored vehicles to mow down peaceful protesters. WE PLEA to the President, and Congress, to push for a full investigation,to bring the perpetrators to justice in accordance with the Universal Declaration of Human Rights, and to cut off military aid until FULL COMPLIANCE. We pray that God may have mercy and accept our repentance and bring all this to a peaceful resolution.